This spring break was unlike any other break I ever took during college – and for good reason! It was in mainland China! I hope you enjoy reading about food poisoning, hiking one of the manmade wonders of the world and traveling like I’ve never traveled before. It wasn’t always pretty, but it was still incredible. I returned safe and sound, although very, very tired from my whirlwind mainland China spring break trip! Words cannot express how happy I was to get back to Hong Kong and “civilization” after spending eleven full days in China. Let’s start from when I left on Tuesday night, March 30th. Getting to Shenzhen was the easy part of the trip; the three girls I was going with (Ilaria, Jen, and Abby) and I met up that evening, and we took the bus (with all of our luggage) and then the MTR straight to Shenzhen. We passed through customs, went to Queen Spa (where we spent the night the first time we were in Shenzhen), had dinner at the same delicious restaurant across the street, stuffed ourselves with fruit and ice cream and went to bed. Easy as pie – this trip was going to be a cinch. Such famous last words – how naïve I was. The next morning we were woken up early, had breakfast, and the doorman at the spa negotiated us a taxi (in Cantonese, of course) to the Shenzhen Airport where our flight was due to leave for Beijing at 12:30 PM. The taxi took longer than expected (about an hour or so with traffic) but we made it with time to spare and our flight was delayed as well, although we didn’t find out for a good 15 minutes after we were supposed to start boarding originally that the gate had changed. The change hadn’t been announced in English. Our new gate was nearby, though, so not really a problem. 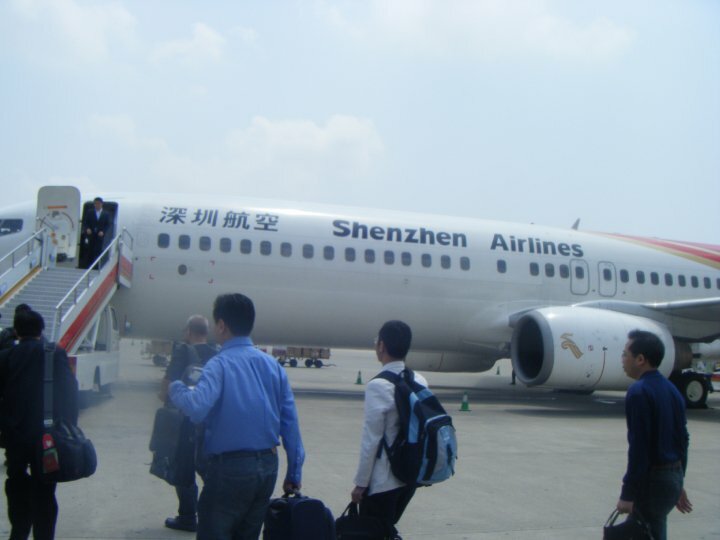 Our Chinese chariot of the skies. See? I wasn’t kidding about the full-meal. And on a three-hour flight no less. Amazing! On the flight, we were served… a full meal! This was only a three-hour flight! 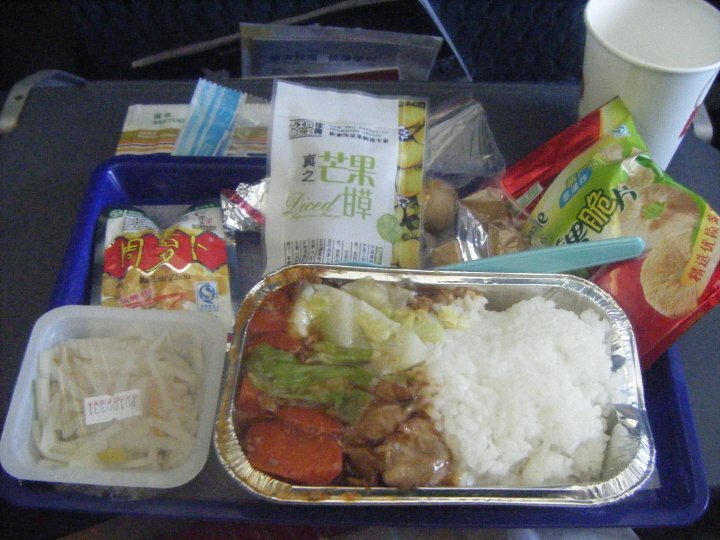 My jaw hit the ground when that happened; I can’t remember the last time a US airline served an actual hot meal on a flight – even flights across the country. What was even funnier was about half an hour before we were due to land, the flight attendants stood in the aisles and demonstrated stretches that we could follow along with in our seats, and a Shenzhen Airlines pop-music video played on the little TVs and they did a synchronized dance to the music! I know. I had never seen anything quite so ridiculous, but that’s China for you. We landed in Beijing and determined we were supposed to take the number three bus to our hostel right across from the Beijing train station. We got into the airport, bought a bus ticket and wandered for at least 15 minutes trying to figure out which bus was number three since none of the signs were in English and none of the buses had numbers of any kind on them. Perfectly sensible, yeah? Finally, we located what looked to be the right bus by asking various people who spoke very limited English (it turned out to be the right bus, thank heavens) and took the two-hour ride to a stop near our hostel. As soon as we stepped off the bus we were assaulted by Chinese who could speak English (this is the first sign that you should be very wary) and wanted to carry our bags (for a fee), direct us to a hotel (for a fee), take us somewhere in a cab (for a fee) or generally sell us anything we couldn’t possibly want or need (for a fee). I was going through my second round of severe culture shock by this point, and thankfully, the hostel was just across the square and we managed to fight our way with our bags to the hostel, get inside, check in and collapse in our room before realizing we were famished. We went back downstairs and were initially directed to the McDonald’s right next door. No thanks – that’s not what I came to China for. Then we managed to communicate we wanted something more “Chinese” and were sent to the fast food dumpling place next to McDonald’s. Super. It was not great, it was not even good, but it was food. Not exactly the most welcoming sight your first night in Beijing. 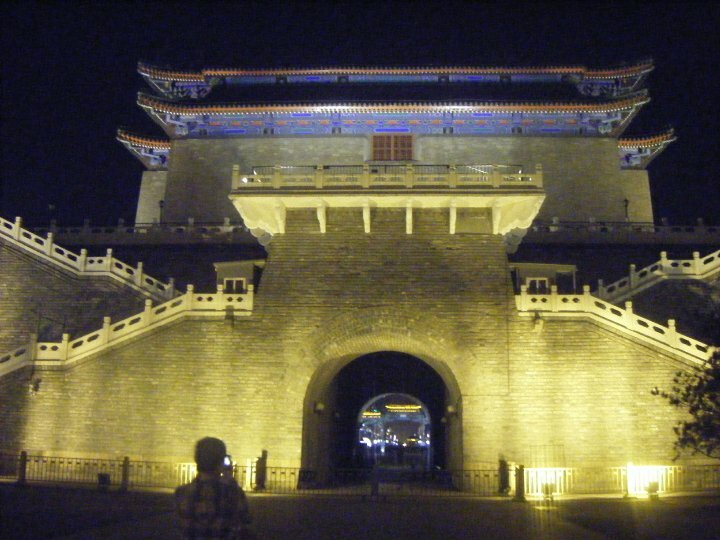 After dinner, we decided to get our bearings of Beijing in the dark (genius idea, wasn’t it?) and took the subway (located just steps from our hostel) to Tiananmen Square. It was probably not the best way to view Tiananmen Square the first time. Imagine being in a country with almost zero English speakers, at night, with very cold and windy conditions (maybe 45 degrees Fahrenheit), and seeing the heart of communism and a giant lit up picture of Mao Tse Tung. Not exactly uplifting and inspiring for a first impression. We walked around Tiananmen Square for a bit before we found a Starbucks (this became the recurring symbol of civilization – and a Western toilet in China) in nearby Qianmen (a Western shopping street) and hunkered down for a while trying to plan our next move. After warming up we went back to the hostel and with the help of our Lonely Planet guidebook (later renamed “The Bible”) mapped our attack for the next day. Stay tuned for the next blog where we explored Beijing and got up close and personal with the Great Wall of China. This entry was posted in Asia, China, Hong Kong and tagged Asia, Beijing, China, Hong Kong, Shenzhen, Spring Break, Travels on March 31, 2014 by Paige N.. Thanks for letting me know about it – I’ll be happy see if I can come up with anything appropriate. I’ll be honest though, while I was studying in China, we weren’t equipped with much in the way of kitchens in the dorms, so almost all of my food was prepared by someone else. Fair enough! 🙂 If you think of something, a recipe would be appreciated! One thing to consider… things like snack foods and beverages would go a long way toward “rounding out” this project. Many of the recipes we’re receiving are on the fancy side, which is great, but everyday quick and easy items are needed, too! I came up with a very quick and easy Chinese stir-fry recipe that I think would be a good addition to the project. Can you let me know the best way to get it to you?